Only days after diamond giant De Beers announced it was shutting down its Snap Lake mine in the Northwest Territories, Canada’s Arctic region has received some relieving news, as a new operation in the area, the world’s largest diamond mine, is almost ready to begin production. 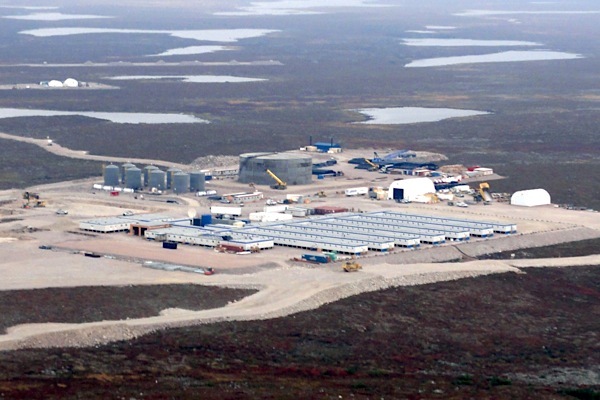 According to Mountain Province Diamonds (TSE:MPV), which holds a 49% stake in the Gahcho Kué diamond mine, the project is nearly 80% complete and on track to begin producing gems in the second half of 2016. “We continue to make excellent progress at Gahcho Kué. Key areas of focus over the next six months are commissioning of the primary crusher and diamond plant, as well as preparation for operational readiness,” Patrick Evans, Mountain Province president and CEO, said in a statement. Situated almost 300 kilometres east of Yellowknife and southeast of the now closed Snap Lake diamond mine, Gahcho Kué — majority owned by De Beers — is also ready to take in part of the hundreds of workers laid off at Snap Lake. Mountain Province said that 41 of those employees have already been transferred to the new mine, and that a further 60 will be brought in next year as the mine prepares for production. The majority of the closing mine’s workforce, which numbered about 800 people, are however losing their jobs. De Beers and Mountain Province have said that almost 700 workers will be needed during the construction period of Gahcho Kué, with at least 400 to be employed over a 12-year mine life. Gahcho Kué is the world’s largest new diamond mine and is expected to produce an average of 4.5 million carats a year over a 12-year mine life. But what makes the mine especially important is the fact that two of Canada's major diamond mines — Diavik and Ekati — are approaching the end of their productive lives, and —although it's smaller— Gahcho Kué would be able to offset the production drop-off. Snap Lake accounted for 1.2-million carats of De Beers’ output of 1.8-million carats from two operational mines in Canada last year. The mine had a difficult year, with output falling 100,000 carats because of flooding and revised underground support standards. In fact, the operation never made a profit in the seven years it remained up and running.